This Amazing Slow Cooker Pot Roast recipe is full of beefy, oniony flavor. A beef chuck roast cooked all day low and slow until the meat is fork tender. 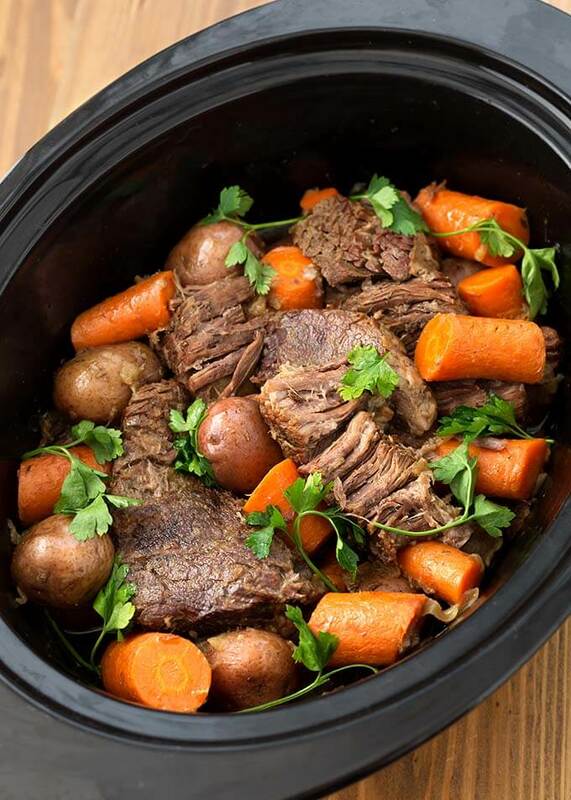 A delicious gravy from the drippings completes this awesome crock pot pot roast recipe. Pot roast is a true American staple. We ate many of my mom’s pot roasts on Sundays after church. Mom cooked her pot roast in a cast iron dutch oven. I used to do it that way too, but with a busy work and family life, a slow cooker pot roast is the way to go! 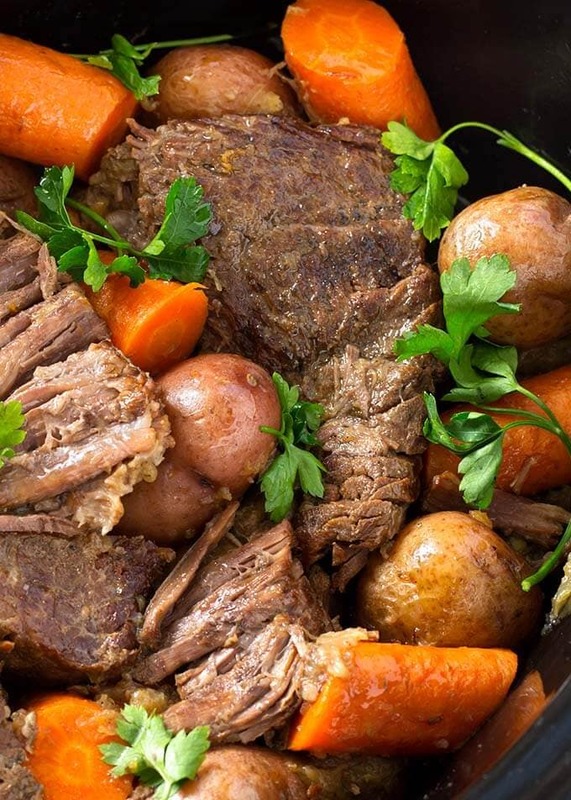 There is nothing fancy or complicated in this crock pot pot roast recipe. No soup mixes, either (not that I’m opposed to them, but we’ve cut down on the sodium). The deep flavor comes from browning the pot roast before slow cooking it. Lots of onion, some herbs, and beef broth adds even more delicious savory flavor to this wonderful meal. You don’t have to brown the chuck roast first, but if you have the extra few minutes, I highly recommend doing it! 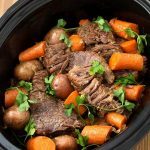 A slow cooker pot roast, as well as other slow cooked meats, benefit in the flavor department when you brown them first. The best roast to use for this pot roast recipe is a beef chuck roast. Find a well marbled roast. As that fat breaks down in the slow cooker, the meat becomes very tender. You should be able to cut it with a fork! If you are going to add veggies like potatoes and carrots, try to add them halfway through the cook time. This way they won’t be too mushy. If you won’t be around to do this, go ahead and add them in the beginning, but cut them in large pieces so they withstand the long cook time. Salt and pepper both sides of the chuck roast. Set aside. Add the onions, bay leaf, and thyme to the slow cooker. Heat a skillet on med-high heat and when hot add the oil. Brown the roast several minutes on each side, or until a nice browning is achieved. Then set the roast on top of the onions. Mix the Beef broth with the bouillon, Worcestershire, and garlic powder. Pour over the roast. 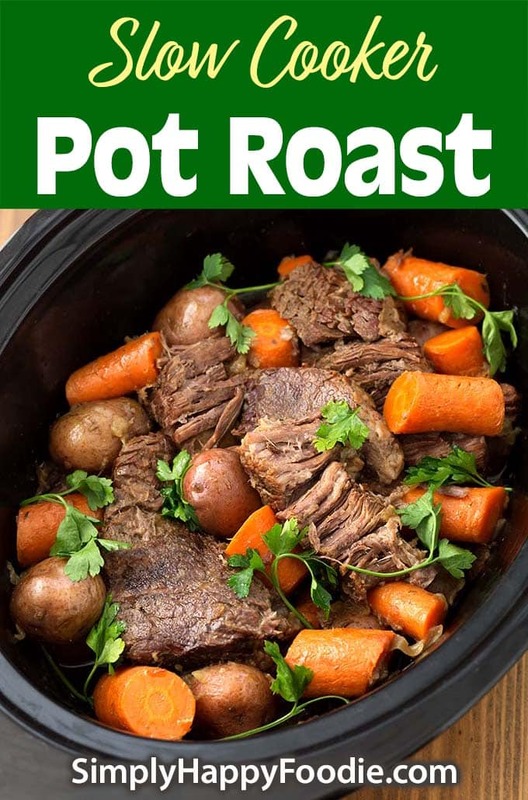 Place the lid on the crock and cook on Low for 6 to 8 hours, or until the pot roast is very tender, adding carrots and potatoes halfway through cooking time. If you won't be able to do that, add them in the beginning, but cut them much larger so they don't get mushy. About 1 hour before serving, mix the flour and water together and add to the slow cooker, stirring well. Remove roast and carrots & potatoes when done, and place in a large serving bowl. Pour some of the gravy over them to keep the meat moist. Put the remaining gravy in a serving container.